This is a video guide for a Ted Talk (18´) that focuses on travelling with a very tight budget. It´s really entertaining and it can be used with teenagers/adults to foster discussions about different topics. Hope you find it useful! 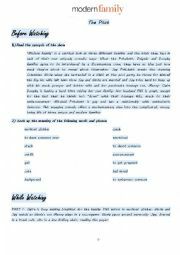 This is a complete guide for the pilot of the American sitcmom "Modern Family" The guide focuses on language and cultural elements. Both written and oral skills can be exploited through the guide. This worksheet has a text for the students to read and add commas. The text is about healthy habits and is written in present simple. This can also be used to practise connectors, punctuation in general and vocabulary related to healthy habits. 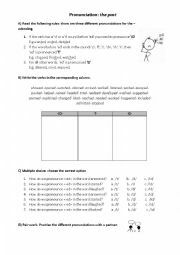 This worksheet includes very simple rules for the ss to understand the three different pronunciations of -ed in the past. There are also three activities to practise the pronunciations. This is a very complete guide that focuses on the pilot episode of the tv series "Suits". It can be used to teach/revise vocabulary related to law, learn colloquial expressions or foster discussions of different types (characters, moral dilemmas, etc) Hope you find it useful! 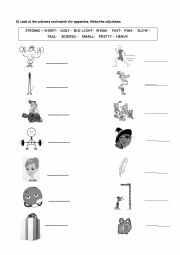 This worksheet can be used to work with adjectives. Students have to read a short text, quotations and classify adjectives. 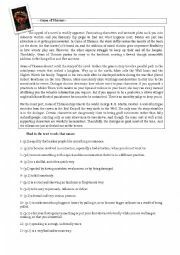 There are also several questions that can generate discussions about the life of celebrities. This is a video guide that focuses on a Ted Talk about alternative ways of education. The worksheets deals with the four skills. Hope you find it useful! 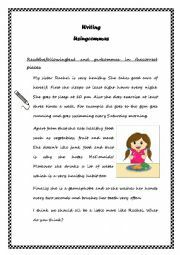 This is a worksheet that mainly focuses on writing. First, ss have to read a description to spot the mistakes. Then, they have to improve. Finally, the ss have to write a description about one of the pictures shown and, then, about someone they know. They will have to use some of the adjectives provided. This is a very simple worksheet for ss to practise adjectives for description. First, they have to write the corresponding adjective next to the corresponding picture. Then, they have to match the opposites. Hope it helps!